The decision to invest in braces is an important one. In the end, it will result in a beautiful, healthy smile. However, along the way you may experience some uncomfortable times, especially after having your brace’s wires adjusted. The good news is that braces pain is typically temporary and can be treated. Throughout your orthodontic treatment, follow-up visits with your orthodontist every four to six weeks are a must to ensure everything is working properly. These visits allow your orthodontist to monitor progress and adjust wires. Adjusting wires can include tightening, bending, or even replacing the wires, as needed. When the wires are adjusted, additional pressure on the gums and teeth can cause some irritation and discomfort. 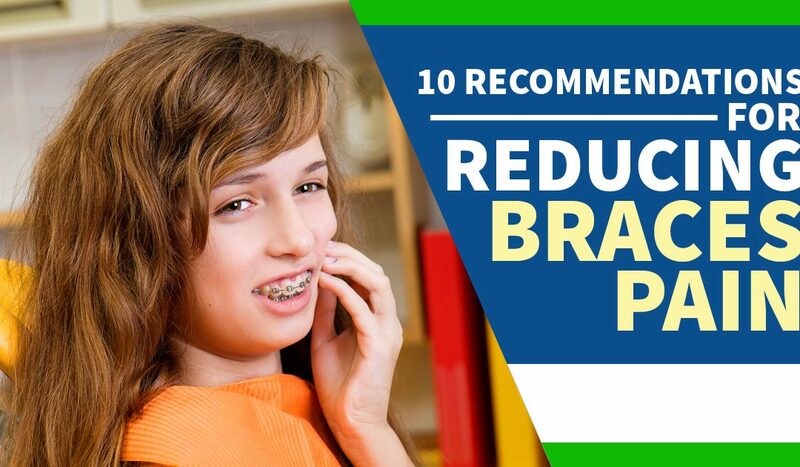 There are several easy and effective ways to reduce the pain and discomfort associated with braces. Below we list 10 recommendations. Ice will work in your mouth just like it does for other injured parts of the body. If your mouth feels sore after your braces are tightened, try applying a cold pack to the area or eat some ice cream or other cold food. Ice packs and cold foods can help reduce pain, swelling, and inflammation, and help relieve the pain. In some cases, sores may develop on your cheeks and gums as they adapt to your braces. Swishing for just 60 seconds with warm salt water can reduce the irritation and alleviate soreness. After your braces are tightened, your gums and teeth will most likely become sensitive. This can make it painful to eat certain foods. As a result, it is a good idea to avoid crunchy or hard foods, such as raw vegetables and chips. Instead, choose softer foods and drinks, such as smoothies, yogurt, soups, and mashed potatoes. After the pain subsides, you can resume your normal eating habits. Just like a massage can ease muscle pain in other parts of your body, massaging your gums with your fingers can help ease the pain. If your gums are swollen it can also help relax the tissue, making your newly tightened braces a little bit more comfortable. A mouth guard can be extremely effective when it comes to protecting the soft tissues of your mouth from your braces. While you should definitely wear them while participating in any sports or physical activities, they may also be beneficial if your brackets or wires are causing sores or discomfort on your cheeks or other areas of your mouth. While you may think teething rings are just for teething babies, the fact is that they can come in handy when it comes to dealing with braces pain, as well. Teething rings are even more effective when you freeze them. Once frozen, simply put one in your mouth and chew on it gently in the area of your mouth that hurts most. Move it around to each of the sore areas until the pain and discomfort subsides. If you begin to experience irritation on your inner cheeks, your gums, or even your lips because of your braces, then orthodontic wax may be helpful. This wax is applied to the metal to reduce the irritation it causes on the inside of the mouth. If there is pain in specific areas of your mouth then consider trying a local anesthetic, such as Orabase or Orajel. These types of over-the-counter gels are often used to help numb the gums of teething babies in order to reduce teething pains and help them sleep. Make sure to only apply as directed, but this can be quite an effective method for reducing braces pain. If you have pain in or around your jaw, then you can also use a heating pad to try and reduce the pain. If you don’t have a heating pad, you can get the same effects from a warm washcloth. This is especially beneficial if you experience unbearable pain and ice or cold food hasn’t been helpful. You may have to use a heating pad several times a day to achieve relief from the braces pain. In some cases the nine ideas above just won’t provide the type of relief needed. If this is the case then you could consider trying over-the-counter painkillers, such as ibuprofen. Be sure to ask your dentist or doctor about proper dosage and only take these if nothing else works. After your braces are adjusted there may be some discomfort. While it varies for everyone, some people have a harder time with it than others. Keep in mind that the discomfort will fade once your mouth adjusts to the braces or new wire adjustments. In the end, you are going to have a beautiful, healthy smile that will make all the discomfort worthwhile.